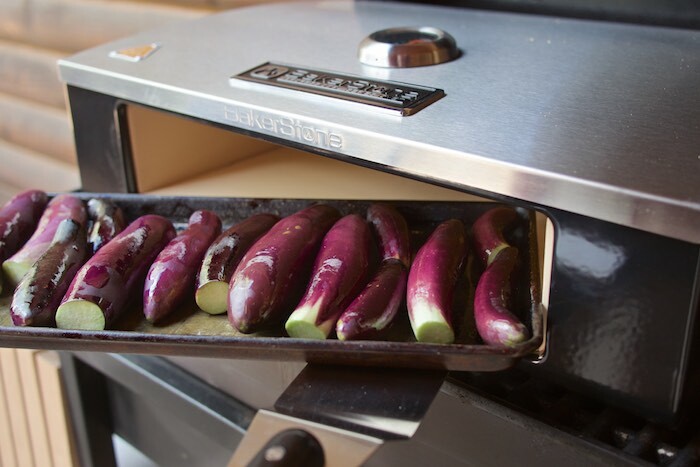 Food Hunter's Guide to Cuisine: Swedish Visiting Cake & A Bakerstone Pizza Oven Box Giveaway! Swedish Visiting Cake & A Bakerstone Pizza Oven Box Giveaway! When temperatures hit 100+ degrees I am reluctant to turn the oven on for our weekly pizza night. But I'm also not willing to give up pizza, that's where Bakerstone Pizza Oven Box comes in. The Bakerstone box is a cooking chamber constructed of 5 pieces of refractory stone, encased in steel. It fits most 3 burner outdoor grills and heats up to 600+ degrees. 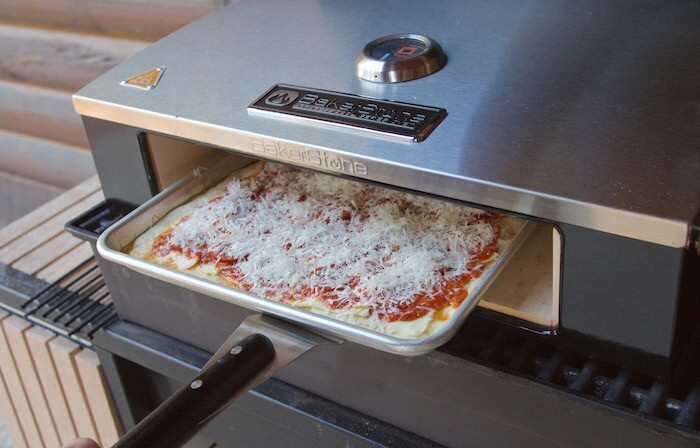 The pizza oven box produces authentic pizza in minutes, without heating up your house. I even baked dessert in it. I can honestly say I am enjoying the Bakerstone Pizza box and the variety of ways it can be used. One of my all time favorite cakes is Dorrie Greenspan's Swedish Visiting Cake. 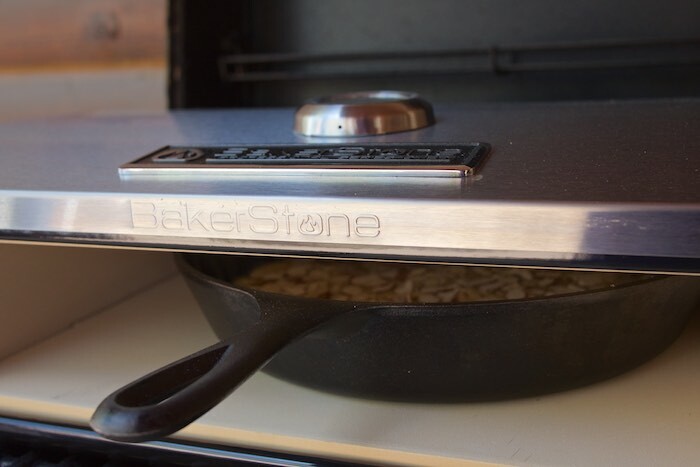 Traditionally cooked in a cast iron pan it is perfect for the Bakerstone. 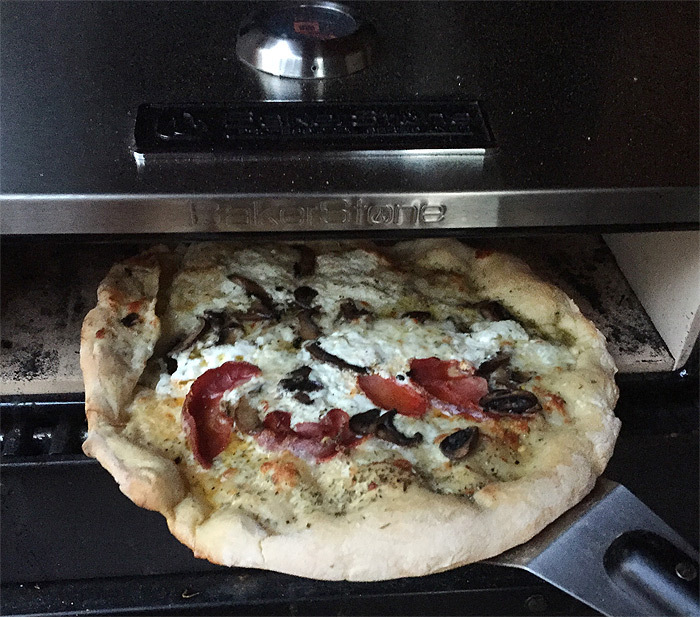 I received a bakerstone pizza oven to try for myself. As always, all opinions are 100% my own. I put arugula on many of the pizzas that I make, the peppery flavor is awesome and it pairs well with many different toppings. Ricotta is my favorite topping on my pizza! Artichokes, sun dried tomatoes, olives...mmmm! I love artichokes, gyro meat and feta cheese! I love pesto, arugula and peppers! This is so cool! I love pepperoni, but it has to have a lot of cheese! I honestly am not very picky when it comes to pizza toppings. Any food that I would normally eat is good for me. I love pepperoni but I also enjoy taco pizza and blt pizza. Not picky at all lol. My hubby would love that bakerstone pizza box, what a great giveaway! I'll have mushrooms, onion, and green or red bell pepper. Maybe artichokes. Italian sausage only if it's sweet sausage with fennel. NO pepperoni. I love the name of that cake...plus it sounds incredible. And oh my gosh, I NEEEED this pizza box in my life. We have pizza night every friday, so it would get a lot of use! My favorite pizza topping is roasted garlic. I love just about anything on pizza, but bacon is always a favorite! Just entered to win because my husband LOVES pizza! I love mushrooms and cheese on mine! Sun dried tomatoes are my favorite. My favorite toppings are garlic, extra cheese, fresh prosciutto put on after the baking, fresh basil, pesto, more garlic. Fabulous! I want to win! I've got to try this pizza. Looks delicious! That looks so cool! I bet it's amazing for pizza. My fav is Italian sausage. My favorite topping is bacon! It would be awesome to not have to turn the oven on during this summer heat! I love veggie supreme: onions, peppers, mushrooms! OMG this is a brilliant idea! It has been SO HOT lately- definitely do NOT want to use the oven! For a traditional pizza, we like pepperoni. If we want to switch it up a bit, we do buffalo chicken pizza- yum! I only get to pick one? I love to have an array of veggies on my pizza, black olives, onions, tomatoes and artichokes. Love it! Lots of cheese and kalamata olives. This is so cool! Our favorite pizza topping is pepperoni. Bacon is my favorite pizza topping! We like onions, artichokes, and spinach. Yum! I love anchovies on my pizza! Fresh fresh fresh - basil, mozzarella, tomatoes, sausage (that my husband makes). Love it all! I am just learning to use sourdough. This would be perfect for the new sourdough pizza crust I am wanting to make. I love cheese and burger on my pizza. Following on instagram as rusthawk1. I follow BakerStone Box on Instagram with the handle @firerunner2379. I like pepperoni and peppers. I love a good cheese pizza, but I also love a BLT pizza too!